Precision Torque’s magnetic particle clutches and brakes operate with a rotating disc linked to a fixed member via magnetic powder. The DC coil magnetizes the powder, producing torque shear forces. Our magnetic particle clutches and brakes are unique because of the wide operating torque range available. 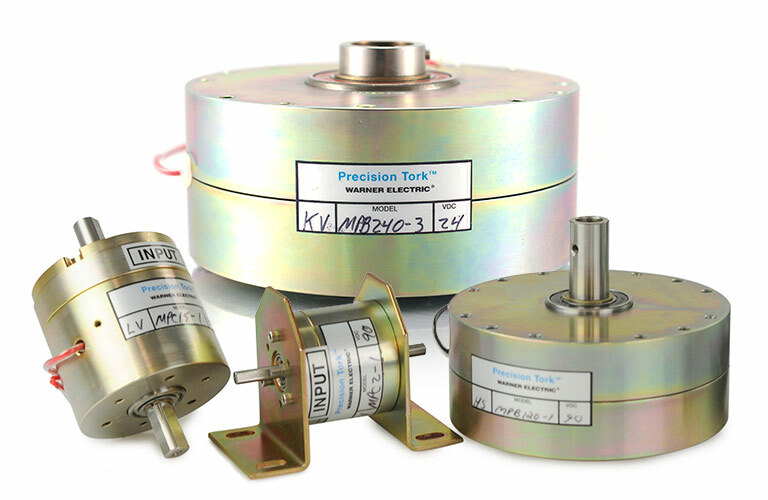 We offer units with a torque rating of .4 in-oz up to 240 lb-in. Torque to current is almost linear and can be controlled very accurately, even at extremely slow speeds. The unique features of the magnetic particle clutches and brakes make them ideal for tension control, load simulation, cycling/indexing, and soft starts and stops. We offer zinc plating for superior corrosion resistance. Precision Torque Control’s unique manufacturing process minimizes internal run-out and concentricity problems. This allows slower speed operation and vertical mounting. Custom designs readily available for special requirements.